Every couple of years a (hell)fire and brimstone preacher floats into the national consciousness and makes the headlines with certain predictions from the book regarding imminent destruction of our species and home. 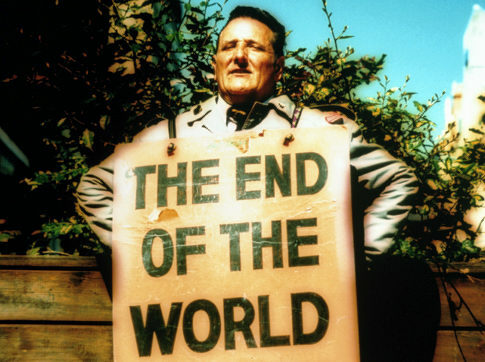 Most recently Harold Camping, the radio evangelist, predicted the apocalypse would begin on Saturday, May 21, 2011. His subsequent revision placed the “correct date” at October 21, 2011. Well, we’re still here, so the next apocalyptic date to prepare for, according to watchers of all things Mayan, is December 21, 2012. So not to be outdone by prophesy from one particular religion or another, science has come out swinging with its own list of potential apocalyptic end-of-days. No surprise, many scenarios may well be at our own hands. Since the beginning of life on Earth, around 3.5 billion years ago, the fragile existence has lived in the shadow of annihilation. On this planet, extinction is the norm – of the 4 billion species ever thought to have evolved, 99% have become extinct. In particular, five times in this past 500 million years the steady background rate of extinction has shot up for a period of time. Something – no one knows for sure what – turned the Earth into exactly the wrong planet for life at these points and during each mass extinction, more than 75% of the existing species died off in a period of time that was, geologically speaking, a blink of the eye. If the Earth exists in a region of space known as a false vacuum, it could collapse into a lower-energy state at any point. This collapse would grow at the speed of light and our atoms would not hold together in the ensuing wave of intense energy – everything would be torn apart.